NJMEA Conference Proposals Now Open! We are now accepting session and performance proposals for the 2020 NJMEA State Conference in Atlantic City, NJ. Please consider sharing your expertise and/or student groups with NJ Music Educators! We are fresh off a very successful NJMEA State Conference. I hope those who attended enjoyed it as much as I did. While in attendance you may have heard rumors about next year’s conference. Now that the conference is over, I am happy to officially announce that the 2020 NJMEA State Conference will be moving to Atlantic City! After many years at the East Brunswick Hilton, we have outgrown the space both in the physical and philosophical sense. By moving the conference to Atlantic City, we have an opportunity to re-imagine what our state conference can and should be. A committee made up of veteran conference staff, and NJMEA members who have experience attending and presenting at conferences all around the country has been meeting over the past few months to decide how we can modernize and improve the conference experience for our members. As decisions become finalized, we will share them via Tempo magazine, the website, and social media. While I know this change may seem unexpected to some, please know that we’ve been discussing this since we hosted the 2017 NAfME Eastern Division conference, and it wasn’t a decision we rushed into. I’m confident that this move will be a positive step forward for our conference. The list of all of factors that lead to this decision are too numerous to put in this message, however I’d like to highlight some parts of the conference experience that we feel will be improvements in Atlantic City. What I have chosen to highlight are the issues that most frequently have been brought up in our post-conference surveys and individual conversations I’ve had with members over the past few years. One common complaint about East Brunswick, and something our members liked about the Eastern Division conference in Atlantic City, was the availability of things to do outside the conference. As anyone who has been to the conference in the past knows, evening activities are limited without the necessity of a trip to a nearby town like New Brunswick. In Atlantic City there will be numerous choices for evening entertainment once the conference sessions and concerts are over. Another limiting factor in East Brunswick was food options, especially for lunch and dinner. Similar to the entertainment options, finding a quick bite or enjoying full meal will be much easier in Atlantic City. Not much elaboration needed here. The parking situation will be much better with this move. You may not know this, but we typically sell out our exhibit space and often have a waiting list for exhibitors. 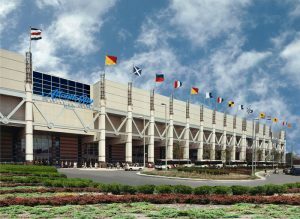 Using the AC Convention Center will allow us to accept more exhibitors, and make moving through the exhibit hall much more comfortable. For those who were able to attend the 2017 Eastern Division conference, you may recall that the lobby concerts were a very prominent feature for that conference. By virtue of where they were located, they were heard by many more attendees. Additionally, we received numerous comments from the employees of the convention center who shared how much they enjoyed being able to hear our student performers while they worked. And isn’t that why we do this? One of the benefits of hosting the 2017 Eastern Division Conference was having the opportunity to try a new conference schedule. We added dedicated concert hours, general assembly sessions with keynotes, and were able to accommodate more performing groups and sessions. Not all decisions have been made yet, but we’re looking to bring some of these features to our 2020 conference. Those of you who send students to the All-State Bands and Treble Chorus may be wondering how those ensembles will be impacted by this change. The rehearsal structure and performance schedule will look very similar to what we offer our Orchestra, Chorus, and Jazz students in November. The All-State Wind Ensemble, Symphonic Band, and Treble Chorus will rehearse in Atlantic City during the conference, just as our November ensembles rehearse during the NJEA conference. Our plan is to make these rehearsals open to directors, and to make them easily accessible within the conference center. Students will then travel home after the conference and report to NJPAC on Sunday, February 23 for their concert. Additionally, our plan is to run busses from locations in central and northern New Jersey so parents don’t have to drive their students. This is what we do for our November All-State students and it works well. More information regarding this will be shared as details are finalized. Planning! We will be spending the next year working to put this all together so when we arrive in Atlantic City in February of 2020 we’ll be walking into a revamped conference that will continue to provide high-quality professional development for music educators. In the coming days we will be opening session and performance applications for 2020. I encourage you to leave your feedback on this year’s conference, and to apply to present and/or bring a student group to 2020. It’s your input and contributions that make the conference what it is! I want to thank you for your continued support of our conference over all these years. I hope that those of you who are regular conference attendees will continue to support our conference. For those who have never been, or have not attended recently, I hope you’ll consider joining us in 2020. Other questions or concerns about the conference program please email Marie Malara at malara97@aol.com.